T Sportline has added a unique touch to Tesla‘s Model X P100D. The tuner added its T Largo widebody package to give the Model X an even more aggressive and sporty look. Custom Tesla lovers will likely be drawn to high-end additions, especially the carbon fiber extended fenders that add to the width of the vehicle. The special kit is limited to just 20 examples, and includes all-new carbon fiber side skirts, a bumper, a front apron, a rear diffuser, and a rear wing. Special black 22-inch multi-spoke wheels paired with Pirelli Scorpion Zero tires complete the exterior profile. Each driver will customize the interior to their own specifications. 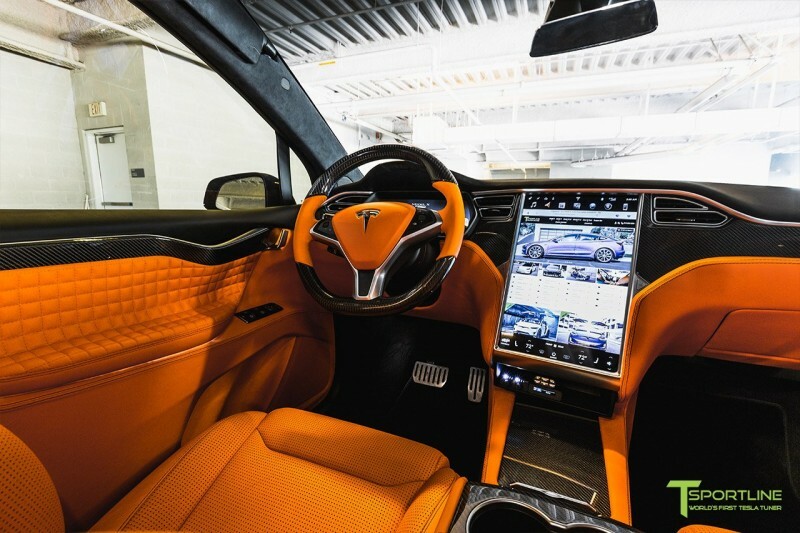 The example hereby stands out with bright orange leather accented with carbon fiber inserts. If orange isn’t your preferred shade, T Sportline can offer almost any color scheme desired.